Wasn’t it just a few days ago that we were talking about a 17-story condo rising in place of a garage between Broadway and West End Avenue — just outside the Upper West Side’s historic district? 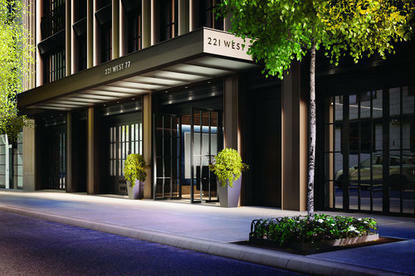 Well, it looks like the UWS has lost another garage, this one located at 221 West 77th Street. According to Curbed, this is developer Naftali Group’s second garage-to-condo conversion, and it’s been in progress for some time now. “With a design by Danish architect Thomas Juul-Hansen and a selection of 26 two- to five-bedroom condos, it’s not slated for occupancy until 2017, [but] its units are officially on the.” How much are we talkin’? Prices range from $4 million — what a bargain — to a whopping $23 million clams. What’s in it for those who buy? It looks like it’s the usual suspects: fitness center, basketball court, on-site parking, and a roof deck.